Orange Comminuted 2:1 is made with oranges of the Spanish Navel type and oranges from Valencia, located in the East of Spain. The oranges that Lemon Concentrate uses to elaborate Orange Comminuted 2:1 are the highest quality ones, due to their provenance the best area in Spain, the Mediterranean region. The good weather conditions -warm during the day and cold at night- allow us to obtain high-quality products with intense flavors. Orange Comminuted 2:1 can be used as a base for beverage such as soft drinks but also to add an intense taste to certain food products. Orange Comminuted 2:1 is made by concentrating the flabedo, albedo and endocarp parts of the orange twice. However, we also supply orange comminuted 1:1, which is concentrated once; orange comminuted 3:1, which is concentrated three times; and orange comminuted 4:1, which is four times concentrated. The type of orange comminuted the client should choose, also known as orange puree, depends on the final use of the product and the client’s necessities. Oranges are sent to manufacturing facilities with modern technologies for its processing and packing, always maintaining the whole properties of the fruit and leaving it ready for its supply worldwide. 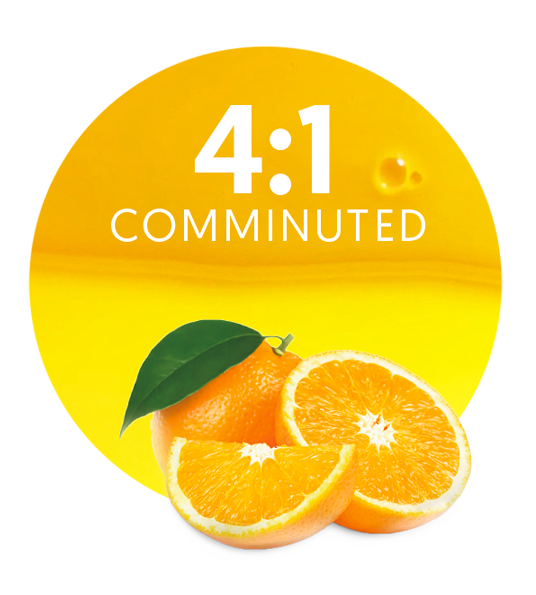 Apart from Orange Comminuted 2:1 and the other products mentioned above, some other Lemon Concentrate’s key products worth mentioning are pomegranate cloudy, pure orange puree, orange cloudy debittered, orange cloudy regular, pure lemon puree, lemon cloudy debittered, lemon cloudy regular, lemon compound, lemon compound 40 Brix grades, lemon fruit concentrate, lemon comminuted 1:1, lemon comminuted 2:1, lemon comminuted 3:1, and lemon comminuted 4:1.